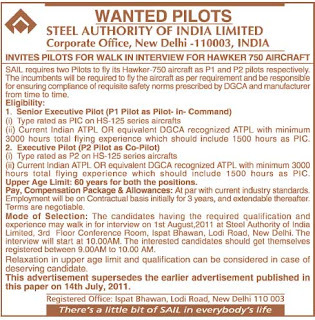 SAIL requires two Pilots to fly its Hawker-750 aircraft as P1 and P2 pilots respectively. The incumbents will be required to fly the aircraft as per requirement and be responsible for ensuring compliance of requisite safety norms prescribed by DGCA and manufacturer from time to time. (ii) Current Indian ATPL OR equivalent DGCA recognized ATPL with minimum 3000 hours total flying experience which should include 1500 hours as PIC. Upper Age Limit: 60 years for both the positions. Pay, Compensation Package & Allowances: At par with current industry standards. Employment will be on Contractual basis initially for 3 years, and extendable thereafter. 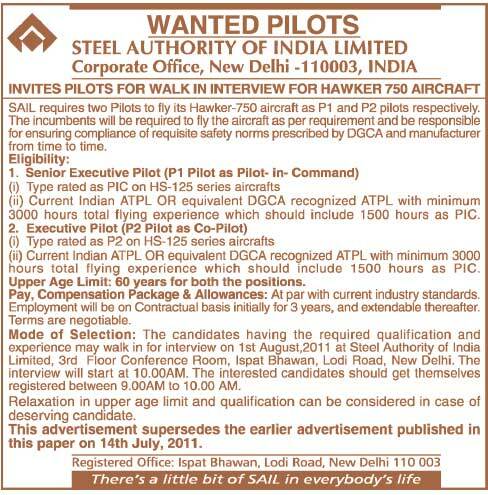 Walk in for interview on 1st Augustp2011 at Steel Authority of India, Limited, 3rd Floor Conference Room, Ispat Bhawan, Lodi Road, New Delhi. The interview will start at 10.00AM. The interested candidates should get themselves registered between 9.00AM to 10.00 AM.